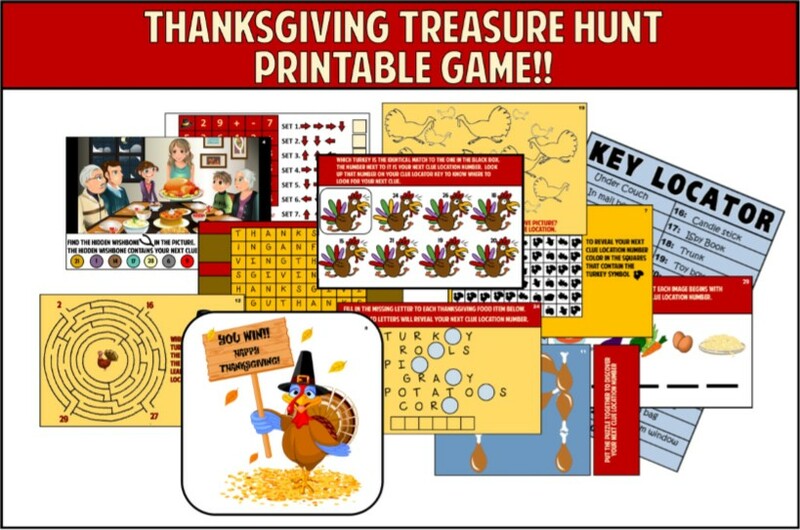 Thanksgiving Treasure Hunt - Printable Game for Holiday Fun! Are you looking for something fun and different to do with your kids this upcoming Thanksgiving? This hunt just might be what you are looking for. It comes in a ready-to-print download, all you have to do is hide the clues and watch the fun begin. This is the perfect activity to entertain the kids while you are busy making the Holiday meal, or as something festive to do in the classroom or church. This hunt can be played anywhere because YOU pick the hiding locations. How does the Thanksgiving Treasure Hunt Work? Players work together to solve the clues. Each clue is a fun brainteaser centered around the Thanksgiving Holiday. Each clue has a numerical answer. When players figure out what the answer is they find that number on their clue locator sheet. The clue locator sheet is numbered 1- 30, and you write down all the hiding locations before the game (you only need 10 hiding places, the rest are all decoys). When they find the correct hiding spot they will find another clue. 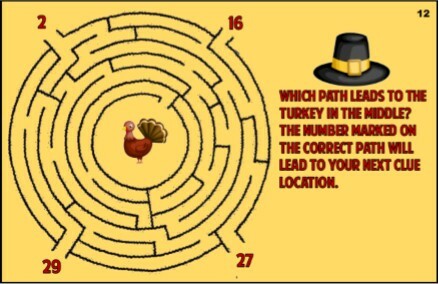 This continues until they complete all 10 clues and find the Turkey ( a winners certificate featuring a turkey holding up a sign reading YOU WON) you can also choose to hide a fun treasure at the end as well. What are the Thanksgiving Treasure Hunt clues like? This treasure hunt comes with two different sets of clues – the regular version and an easier version. You can pick which set best fits your group, or you can even mix and match them. Below is a few examples of the clues included. These two clues are from the easier version (the challenge and the easier version are both included in the download). In the challenge version you will find the same clues except a little more difficult. 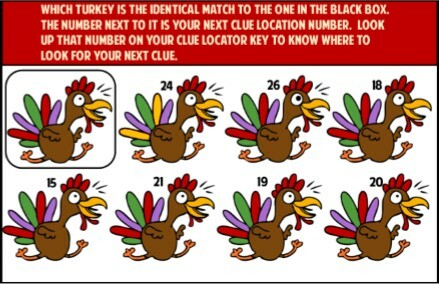 For example on the first clue shown below, in the challenge version players have to find the two turkeys that match instead of just finding the match for a specific one. In the second example the players have four paths to choose from, in the challenge version they have nine and the puzzle is slightly more complex. Who Can Play the Thanksgiving Treasure Hunt? The Thanksgiving Treasure hunt is perfect for kids six and up, as long as they can read and do basic math they can play. This printable treasure hunt can be played by one child or a whole group of children. If you have more than five players you may want to consider trying the competitive version where players are divided into teams to compete to see who can find the turkey first. Is the Thanksgiving Treasure Hunt played cooperatively, or is it a competitive game? It can be either! You can have players work together to solve the clues and find the turkey or you can divide them into teams to play against each other. If you want to play a competitive version the you will need to print out two sets of clues (or more depending on how many teams you have) and print out a separate KEY LOCATOR for each team. Then simply change the KEY LOCATOR hiding locations for each team. So for example, though the answer might be 4, each team will have a different location listed under number 4 so that they are not all going to the same place at the same time. That depends on how long it takes the players to solve and find the clues, on average this takes between 30 minutes to 1 hour. It also depends on how hard and far apart you hide the clues. Where can this treasure hunt be played? ANYWHERE! Because you decide where the hiding locations are you can play this game anywhere. In the house, in the yard, at church, in the classroom. As long as there is enough space for it to be fun then it can be done. 10 eye-catching colorful clues. Each one offering a different kind of fun challenge. 10 MORE clues that are similar to the original set but the challenges are a bit easier. Editable key locator sheet. Just type in your clue location and print. You can also print it out blank and fill in the spaces with a pen. Winning Turkey Certificate to be awarded to the winner or winning team. How do I set up my hunt? Open up in adobe reader. Print out clues and key locator sheet. Follow directions on how to hide them. VOILA! – your done and ready for the fun! How long will it take to receive my hunt? Once you complete your order you will receive an email with a link for an INSTANT DOWNLOAD! GET Your Thanksgiving Treasure Hunt NOW! Once you play this treasure hunt I know you are going to be thrilled – I feel a family tradition coming on. I worked really hard to create this hunt and I need your help getting the word out. Please tell your friends about my site and about this hunt. Are you into Pinterest? Please pin my hunt or share on Facebook.